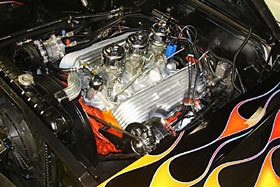 BLACK DEL RAY WITH A 348 ENGINE AND A TRI-POWER TO TOP IT OFF. THIS CAR IS LOADED WITH 4-SPEED, VINTAGE AC AND THREE COLOR FLAMES. This car is a tremendous value. The car has had a boatload of money spent on it to get it to what you see now. As the Chevy Add said �As nifty as it is thrifty�! The nifty thing about this business man�s sedan is the 348 with original 1958 GM 3X2 Carbs and intake! Yes it has an original H coded 1959 348 with a tri power intake dated late 1957 and it runs fantastic and gets with the program. 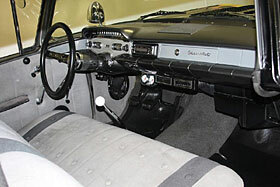 The engine is launched with a Muncie 4-speed transmission and backed up with a posi-traction rear end. 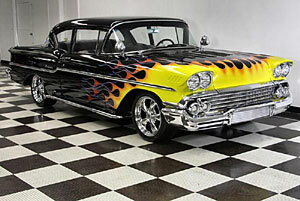 This flamed beauty has a great paint job and a very solid and intact metal bodyunderneath. The car has newer re-chromed bumpers and very nice original stainless and chrome throughout the car. The hood has the time consuming louvers stamped into it which match the character of the awesome looking grill. The tear drop spotlights and chrome lake pipes finish off this stunning nostalgic street machine. The upholstery person that did a great job on the grey custom interior and it shows. Some upgrades to the inside are power door locks, Hurst shifter and vintage AC that blows cold. Newer exhaust, has a nice rumble.